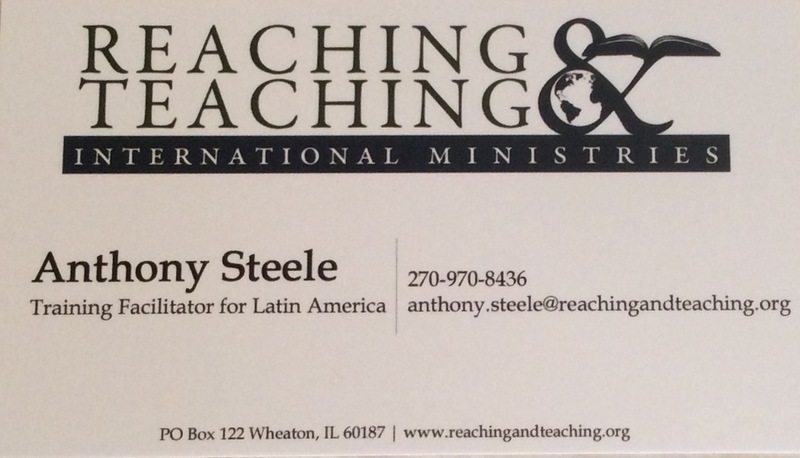 In this post it is my hope to better explain my new role with Reaching and Teaching International Ministries (RTIM) hopefully to clear up any confusion that friends and supporters may have and to help you pray more effectively. This post will be a sort of list of FAQs or frequently asked questions that might be in some of your minds. What are you doing now? My job description with RTIM includes the facilitating of existing RTIM training projects in Latin America as well as the development of new ones as the Lord may lead. It is my responsibility to travel to each site (especially new ones) for the first training project and then to do follow-up visits as much as possible. I am also responsible for developing a database of information for each site to help staff and volunteer teams know exactly what the on-the-ground reality is at each site. Finally, I am expected to travel to promote RTIM stateside among churches, conferences, etc. – especially in those that are Spanish speaking. Where will you be traveling? RTIM currently has training sites in Brazil, C*ba (not a typo), Dominican Republic, Ecuador, Haiti, Mexico, Panama, and Peru with new sites being considered in these countries as well as countries such as Argentina and Bolivia. As all of these are in Latin America, it is my responsibility to do what I mentioned above in each of them. In addition, I will have the need to travel considerably while I am in the USA. Are you still a missionary? That is a very good question. In my heart I am still a missionary because since my childhood I have had a burning desire and calling to be a missionary. However, in the strictest sense, I am a servant of missionaries and local churches and pastors on several mission fields as I serve the Lord in the new role to which He has called me. I do not now live in a foreign country. I live in the USA again. However, I am traveling to many foreign countries now on a regular basis. I will let you decide, based on your definition of a missionary, if I am still one. I only know I am where God has called me to be for this time. What is your relationship with Southern Baptist work? RTIM is currently in strategic partnerships with the IMB and IMB missionaries in places like Brazil and Panama. These partnerships are sure to increase with the current strategy direction of Dr. David Platt and the IMB leadership. RTIM’s director, Dr. David Sills, is professor of missions at The Southern Baptist Theological Seminary and has a long history of and commitment to Southern Baptist life and work as do I. Is your work slowing down? By no means! If anything, my work and responsibilities have increased dramatically. Are you still working in Mexico? I am! I still have a heart and burden for Mexico and I am seeking and developing new projects there as well as other parts of Latin America. I used to only work in one part of Mexico. Now the whole country of Mexico and indeed all of Latin America is my mission field. Have your financial needs decreased? No. The opposite is true. Now that we are living in the states again our living expenses have increased considerably. Plus, as you may imagine, traveling and ministry expenses have increased dramatically. Whereas, I used to travel in one part of one state of Mexico, I am now traveling in the entire Western Hemisphere! As such, my domestic and foreign travel budget alone has increased by $15,000-20,000 per year allowing for 8-10 foreign trips and 5-6 domestic trips per year. I also have a rather urgent need for travel funds as I will be traveling to Mexico, Panama, Ecuador, and Peru before the end of May. What are your needs? As always, above all, I need your prayers. My new responsibility is huge and, to be honest, it feels vastly bigger than I know I am. That is where faith comes in. I serve a God who is far bigger than my responsibilities and abilities. I am always on the search for individuals, churches, associations, etc. who feel the call of God to be involved in strengthening local churches and church planting in Latin America through training pastors and leaders. I hope many of you are praying about this. Beyond these needs, the obvious need is for financial support. I have honestly and accurately shared my travel needs if I am to fulfill my responsibility. Beyond travel expenses, I draw a regular salary from my support funds that is approved by the board of RTIM. That amount has increased as well since we moved back to the states due to increased living expenses. I am currently receiving a salary that is in line with if not somewhat lower than that of the average senior pastor of a Kentucky Baptist Church. Doesn’t Reaching and Teaching pay your salary now? Reaching and Teaching is my employer and, as such, pays my regular salary each month, but does so out of the funds that I raise – not out of the general fund or an agency payroll account. All RTIM missionaries and staff are required to raise their full support – salary and ministry/travel expenses. How can we give? Beverly and I are very grateful for the faithful giving of many of you over the past years. We are aware that it is a carefully prayed-through sacrifice on you part as individuals or churches. We need those regular monthly, quarterly, bi-annual, or annual gifts to continue frankly. In addition, I need to fund the travel needs mentioned above. It would be a blessing if you would consider any of the following: monthly or regular support, a one-time special gift, church love offerings, special missions offerings, V.B.S. missions offerings, etc. As you can imagine, it is a soul-searching process on our part to ask for money and we are not in any way ungrateful for anyone’s current giving level. Your giving is a blessing. However, the needs are what they are and, now, hopefully you have a better idea of those needs. You may check out the “Give” section of my blog to know how to send your tax-deductible donation. If you want to give online, follow this link and fill out the form provided. Thank you for anything the Lord may lead you to do to give, pray, or go.